TORONTO A new video that surfaced Thursday shows Toronto Mayor Rob Ford in a rambling rage, using threatening words including "kill" and "murder," as the saga that has gripped Canadians for months took yet another twist. It's been a whirlwind of a week for Ford, who on Tuesday admitted to smoking crack in a "drunken stupor" about a year ago. 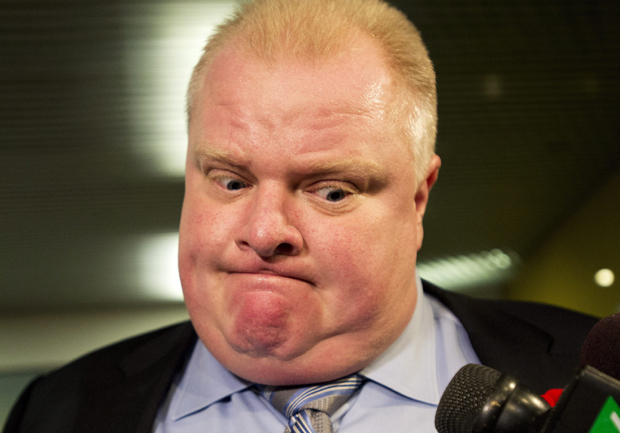 Police said last week they had obtained a different, long-sought video that shows Ford smoking a crack pipe. Ford said Thursday he made mistakes and "all I can do is reassure the people. I don't know what to say." "When you are in that state ... I hope none of you have ever or will ever be in that state," Ford said. "It's extremely embarrassing. The whole world is going to see it." In the new video, a visibly agitated Ford paces around, waves his arms and rolls up his sleeves as he says he'll "make sure" the unknown person is dead. Ford tells another person in the room, possibly the man filming the video, that he wants to "kill" someone in an expletive-laced rant. "Cause I'm going to kill that (expletive) guy," Ford says. "No holds barred brother. He dies or I die." At one point he says "My brothers are, don't tell me we're liars, thieves, birds?" and then later refers to "80-year-old birds." The Toronto Star that it purchased the video from "a source who filmed it from someone else's computer" and that "the person with the computer was there in the room." City Councilor James Pasternak urged Ford to make a "dignified exit." "The video is very disturbing," he said. "It's very upsetting, it's very sad." City Councilor Giorgio Mammoliti, a Ford ally, urged the mayor to enter rehab and said in a statement he fears "that if the mayor does not get help now he will succumb to health issues related to addiction." Ford lawyer Dennis Morris told The Associated Press the context of the video "is skeletal." "What we have to do is find out when it was taken," he said. "Was it taken eight, 10 months ago or a short time ago? I'm going to try to find that out too. Maybe the Toronto Star knows better." Asked if Ford told him about the tape, Morris said: "I can't comment, but I don't think we really know." Earlier Thursday, Morris said he was in talks with the police for Ford to view the video that shows the mayor smoking crack, as city councilors stepped up their efforts to force him from office. The mayor's travails were taking their toll on his supporters. Canada's finance minister became emotional when asked about Ford, a longtime friend. Police are seeking to question Ford. Morris previously said Ford would be willing to go view the tape but would not answer questions. Police have not charged Ford, saying the video didn't provide enough evidence against him. A police spokesman declined to comment. Municipal law makes no provision for the mayor's forced removal from office unless he's convicted and jailed for a criminal offence. City Councilor Denzil Minnan-Wong, a member of Ford's executive committee, said Thursday he plans to amend a motion he has filed that would ask Ford to take a leave of absence. The amendment takes the unprecedented step of asking the province of Ontario to pass legislation to remove the mayor if he does not agree to take a leave of absence. The measure could be voted on next Wednesday. The province, however, has no plans to step in and amend the law to allow Ford to be forced from office, Ontario Municipal Affairs Minister Linda Jeffrey reaffirmed Thursday. Premier Kathleen Wynne has said she's concerned that Ford's personal issues were making it difficult for the city to carry on normally. But she said it was up to police, the courts or the mayor to take action. Ford acknowledged a drinking problem for the first time Sunday, saying on his radio show that he was "hammered" in public at a street festival in August and "out of control" drunk, carrying a half empty bottle of brandy around city hall after St. Patrick's Day last year. He then made his stunning confession to reporters Tuesday that he had smoked crack while drunk. The mayor has called on police to release the tape, but police said they are prohibited from doing so because it is evidence before the courts. Police said the video will come out when Ford associate Alexander Lisi goes to trial on drug and extortion charges. Toronto Police Chief Bill Blair has also said police have a second tape, but he has declined to discuss what's on it. Police spokesman Mark Pugash told the AP the video released Thursday is not the tape Blair talked about. The allegations about Ford smoking crack first emerged earlier this year when reporters from the Toronto Star and the U.S. website Gawker separately said they saw that video, but they did not obtain a copy.